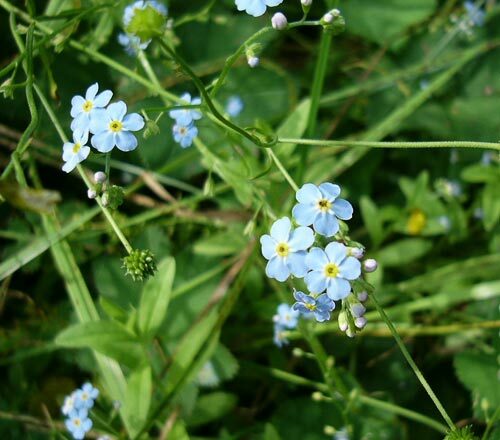 AgroAtlas - Weeds - Myosotis arvensis L. - Common (Field) Forget-Me-Not. Myosotis arvensis L. - Common (Field) Forget-Me-Not. Myosotis scorpioides var. arvensis L., M. intermedia Link. Plant with numerous stems branching sometimes from basis or from middle of stem, 20-40 cm in height. Lower leaves oblong, drawn-out toward petiole, aggregated in rosette; upper ones sessile, narrow-ovate or elongate-lanceolate. The stem and leaves are covered with erect hairs. Flowers blue (seldom white), aggregated in a raceme. Pedicel at fruits twice longer than serrate calix. Corolla with short tube, with bend being 2-4 mm in diameter. Nutlets oblong, triquetrous, brown or black. One plant produces about 700 seeds. Only radical rosette of leaves can form in the first year, and floriferous stem forms in the second year. Blossoming since May till October. Fructifying since June. Grows in almost all European part of the former USSR, in the Caucasus (Ciscaucasia and Dagestan), in Western Siberia (including Altai), Eastern Siberia (from Yenisei to Baikal), Central Asia. Grows on the ruderal places in addition to cultivated lands, along roads, on fallows and dry meadow hillsides. Occurs less often toward southeast. Segetal-ruderal weed. Considering as a weed in crops in the north mainly (winter rye, barley, oat, flax, potato), in gardens, kitchen gardens, on sfallows. Meets frequently, but sparsely. Control measures are agronomical actions and chemical weeding.